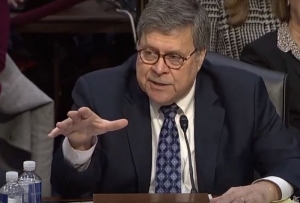 A screen grab of William Barr at the Senate Judiciary Committee hearing Tuesday. Former North Carolina Supreme Court Justice Bob Orr and former state Court of Appeals Judge Gerald Arnold are old enough to remember the issues and debacle surrounding Watergate — they also grew up during the Cold War and understand well the threats imposed on a democratic system. They said during a Tuesday teleconference that the Senate Judiciary Committee hearing on President Donald Trump’s nominee to be the next U.S. attorney general, William Barr, was of utmost importance in light of special counsel Robert Mueller’s investigation into the administration’s relationship with Russia. “The public should be able to believe the legal process and procedures we’re going through with here is going to be fair and impartial, and to be fair and impartial, it has to be independent,” Arnold said. Barr, if confirmed, would succeed Jeff Sessions. He served as both attorney general and deputy attorney general during George H.W. Bush’s administration. He has openly condemned the Mueller investigation, and he’s been criticized by Democrats for his views on everything from executive power to immigration and mass incarceration. Orr said the protection of Mueller’s investigation needed to be a top priority for any attorney general in this administration. He said there was an extraordinary external threat and the investigation needs to be full and thorough. “I have absolute faith and confidence in Robert Mueller and his team, in the law enforcement and intelligent communities that serve this country,” he added. There are a number of ways an attorney general could impede Mueller’s investigation, including by limiting the resources available, having improper communications and not releasing the final report to the public. The latter seems hard to conceive of though, Orr and Arnold said. Susanna Hailey, of Law Works, who hosted the teleconference, said Barr’s nomination was the most significant since former President Richard Nixon’s nomination of Elliot Richardson, a former U.S. attorney general who opted to resign when Nixon ordered for him to interfere in the Watergate investigation. Hailey said Trump, through his actions has said he wants an attorney general who will undermine Mueller’s investigation. The Senate hearing is underway today. You can watch it live here. Orr and Arnold comments are serious are should be taken that way. Our representative democracy at stake. Too many already believe the “system” doesn’t work anymore.